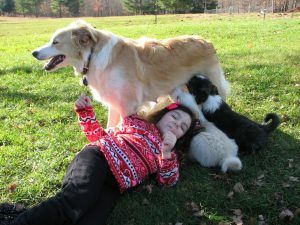 Penuche is a well-rounded farmcollie who strives to please her owner. She has herded goats and chickens, using a dominant stare and air-nipping to get them to move. Penuche prefers to drive, and keeps a respectful distance from her charges as she herds them. She is especially gentle with baby livestock. Her farm is kept carefully in order as she alerts to escaped animals, returns them to their pens, and protects the property from predators. She has killed snakes and foxes; she alerts to coyotes and predatory birds. Babies of all species are always cared for, and visitors are calmly announced, though she resents some men’s voices. Penuche hunts vermin regularly and enthusiastically, using scenting to find them. She will tree prey, but leaves it there once treed. Copyright © 2019 American Working Farmcollie Association. All Rights Reserved. The Carton Theme by bavotasan.com.